Hailing from Fort Worth, Texas, Ginny Mac is a former member of the two-time Grammy Award winning group named Brave Combo, based in Denton, TX. Brave Combo has been noted for its rabid cult following across the country, a notable fan being David Byrne, who chose them as his wedding band. It was a good vehicle for Ginny Mac to begin her professional career in 2011 because, as Paste Magazine noted, “Brave Combo, is…eclectic and artistically ambitious, with a high degree of musicianship and a strong DIY ethic.” Since 2013, she has performed with her own band, and divides her time between Los Angeles and Texas. Unlike some bands that feature a keyboard player who may whisper a few well placed right hand chords but never goes near the bass keyboard of the accordion, Ginny Mac is all over the entire instrument. She is unafraid and unapologetic of the fact that she is an excellent musician and a dynamic entertainer. In recent memory, it’s unusual to see an accordionist play while singing solo, and to do both, well at the same time. Ginny Mac combines both voice and instrument, masterfully, with each complementing and supporting the other. She has a beautiful, sultry voice that lends itself well to the songs that she chooses to perform. In spite of the enormity of her accordion on her small frame, a seriously full sized Scandalli, Ginny Mac is seasoned, comfortable and confident on stage. For her range of proficiency and performance, a smaller accordion would likely be inadequate. When she is not busy with an active touring schedule, Ginny is writing and arranging new original music for an upcoming album and collaborating on multiple musical projects. With a repertoire that covers vintage country,(‘I Fall to Pieces’) Orbison, (‘ Blue Bayou’) Texas Swing, Jazz, Gypsy Jazz, Parisian style accordion and everything in between, it’s taken for granted that Ginny can play and sing anything. Ginny Mac has recorded four albums; the newest released in Spring 2014, “On The Street Where You Live,” is a collection of classic tunes and originals, featuring many of her friends and greatest musical influences. The project includes Grammy Award winners Woody Paul and Joey Miskulin (Riders In The Sky), legendary Nashville fiddler Buddy Spicher, the great bassist Bob Moore (Roy Orbison), and several of Nashville’s premier musicians. “It was an unforgettable experience,” she says, “I was fortunate to learn so much and make music with these wonderful people.”When she is not busy with an active touring schedule, Ginny is writing and arranging new original music for an upcoming album and collaborating on multiple musical projects. Lately, she is concentrating on the music of Queen and her hero, Freddie Mercury, who inspired her to perform (and also to refuse to have her own overbite corrected). While it’s easy to see the accordion’s place and performance in history, it’s more difficult to determine what the future holds for the accordion in popular American music. Will it grow in popularity as an acoustic instrument, or evolve into a futuristic instrument with a totally different sound, or just fade away? I believe that it is a brand new day for the accordion in American music. 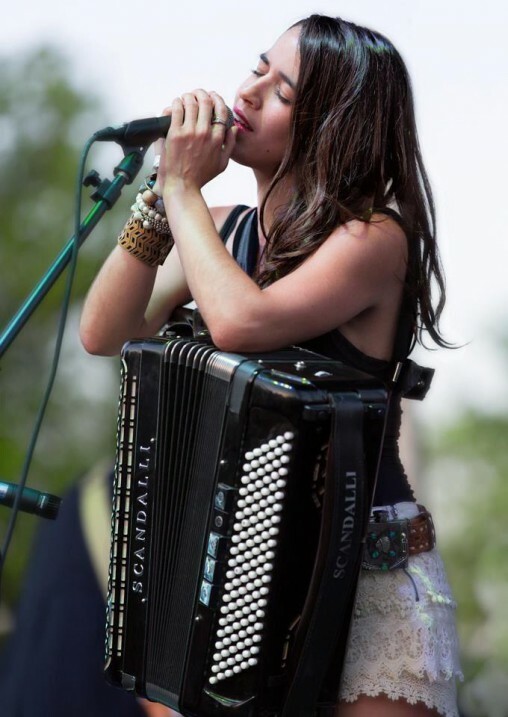 In my search, I have found that the accordion is more present than ever in the “people’s music” in America, Country, Pop, Rock & Roll, Jazz, Alternative, and all kinds of ethnic music and even circus music. Ginny Mac is performing in many of these genres. Whatever direction she decides to take the accordion, or not at all, that is the way the future of the accordion will go, as well. I’m looking forward to seeing her evolve as an entertainer and also seeing the accordion accompany her on her journey.